Bullet Review:I continue to be hugely entertained by Usagi. It's one of those trades I can pick up and know I will enjoy, front to back, either at a leisurely pace or break-neck speed. I'm stopping to review this 48 pages in because, whatever else may lurk afterwards, I've just seen the saddest page ever crafted in the comics medium. Stan Sakai is a genius. You don;t need to know anything about books #1-5; grab this and read the second story in. The thing I liked most about this volume is it dealt with more Japaneses folklore and mythology then the previous volumes. I particularly liked the story were he is telling the village kids a fabled version of his own story. So to see Stan Sakai drew some supernatural beings and ghost from Japanese culture was really fun.The ending to this volume was bitter sweet in my option. We have the return of Jei and Usagi returns to his home village to find Jotaro has been kidnapped by Jei. Most of the people think Jei is a lunatic for talking to the gods, but this volume you begin to think he might have that ability. Because he was right about what he says with Jotaro.Also I was told why Stan Sakai named the villain Jei. Just add "-san" to the ending and it all makes sense. This guy knows how to make you smile. Sakai seems like Aragones too. They are both really good guys and it's really hard not to fall in love with they're work. Yet again, Stan Sakai does not disappoint. This book does not have all my favorite characters (Gen, Zato), but it reveals some new facts about Usagi's master (Katsuichi) and an interesting twist to the relationship between Usagi and Mariko.An interesting coincidence - we all know Sakai is inspired by Kurosawa among others. After all, Sakai is writing the definitive graphic novel on Samurais while Kurosawa has the same distinction in films. Towards the end of the book, Usagi teaches young Jotaro the true meaning of a samurai sword - that the best sword always remains sheathed. That's exactly what Sanjuro (Mifune) realizes in the film. Sakai somehow manages to take his art to another level in UY book 6. Both art and storytelling are palpably finer. Although I already love this series, it was a pleasant surprise! Few comic books have ever made me cry. This one did. A fantastic edition to the Usagi world. Perfect for Halloween time as it features ghosts, demons, spirits... Circles is the perfect name for it as things do come full circle for our samurai warrior rabbit. The book acts as a series of vignettes and short stories but each one adds to the world and types of characters we meet. The first two verge on horror, very spooky. A demon curses a bridge at the end of town and no one can cross it without losing their life. Sakai is pitch perfect in spookiness. His imagery is wonderful. Really good at drawing horror even in this light style. The stakes are ramped up for sure for the townsfolk. Real fear and loss abound in this world. It makes the adventure and the journey that much more worth it. Second Usagi meets the ghost of a betrayed wife needing to get revenge on her husband and uses Usagi as a pawn...without his knowledge. It's very funny how dim Usagi can be sometimes. Another tale sees Usagi meeting up with a samurai and a gambler who think they can use him to make a lot of money. This is very touching as it features the story away from Usagi of the other samurai's family and the consequences of his actions. Very touching and sad. After these short tales, we get into Usagi's past as he reunites with his sensei. This circles back to previous encounters too...it's really nice to see this character again not seen since book 2. Lastly he returns to his home, the village he grew up and reunites with his former sweetheart and his new family. Thetension of him being there, especially with his old friend who married his sweetheart and their son. A nice love triangle complicated with the kidnapping of the boy by a group of bandits led by a demon. Just lots of high stakes with consequences. It's wonderful. You really don't know who is going to survive or who is going to lose someone dear to them. And there's always humor in the drawings along with the adventure. Fans of Bone should read this series. Stan sakai is a genius. Perfect art, perfect writing. Schließt sich der Kreis?Miyamoto Usagi ist auf der Heimreise, er hat genug vom Krieg. Doch auf dem Weg in sein Heimatdorf, das er vor vielen Jahren verlassen hat, stehen ihm einige Hindernisse im Weg - schließt sich für ihn trotzdem der Kreis, und kann er sich auf ein friedliches Landleben mit seiner Jugendliebe Mariko freuen?Die enthaltenen Geschichten im Einzelnen:"The Bridge""The Duel""Yurei""My Lord's Daughter""Circles"Die letzte Geschichte, "Circles" ist vom Umfang her die längste - doch leider auch die schwächste. Wie ich schon zu anderen Bänden geschrieben habe, funktioniert diese Reihe in den kürzeren Formaten einfach besser. Und die 4 kurzen Geschichten gehören mit zum Besten, was Stan Sakai bisher gezeichnet hat; sie alle enthalten ein starkes fantastisches Element und zeigen seine Kreationen von ihrer besten Seite: "My Lord's Daughter" ist einfach brillant, und auch "Yurei" zeigt wieder einmal, dass dies keine Kindercomics sind, sondern Stoff zum Nachdenken für Erwachsene bieten.Der beste Band der Reihe bisher, und ich gehe davon aus, dass es auf diesem hohen Niveau, sowohl erzählerisch, als auch zeichnerisch, als auch von der hervorragenden drucktechnischen Aufmachung her, weitergehen wird. Si les premières histoires courtes de ce tome sont "classiques" (oui, rien chez Usagi n'est juste quelconque), l'histoire - un peu plus longue - qui conclut ce tome est simplement sublime. on y voit Usagi tenter de revenir dans son pays natal, mais s'y heurter à son passé d'une manière aussi délicate qu'insupportable pour lui, tiraillé qu'il est entre son honneur passé et son amour toujours présent. I know I still have a long way to go, but I've really been enjoying reading the Usagi Yojimbo graphic novels. 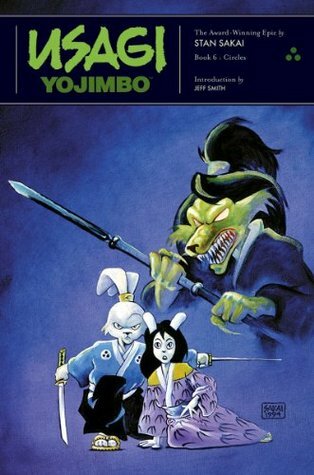 In "Usagi Yojimbo: Circles", there are five short stories... "The Bridge", "The Duel", "Yurei", "My Lord's Daughter", and "Circles". And in almost all of the stories, Miyamoto Usagi ends up fighting demons, monsters, ogres, and other samurai/ronin. Looking forward to reading the next in the series. Better than all the Usagi Yojimbo books that precede it, including The Dragon Bellows Conspiracy. The villains remain cartoonish—Jei wonderfully so—and the romance plot is soapishly melodramatic, but Sakai's earnest characters, world, and ever-improving art combine to create a quality beyond 'tolerable'—it's well and truly a great comic. Dva kaidany (speciálněMost je atmosferická žánrová lahůdka se vším všudy), dvě typické samurajárny (nádherně nejednoznačný Souboj s kompozičně nezapomenutelnou poslední stranou příběhu) a jedno vypointované akční inferno navrch. Lošťomiloušká zviřátka co nastavují zrcadlo a poučí zábavnou a chytrou formou. Sakai je prostě chytrý a velmi schopný pán. Another steadfast chapter in the Usagi Yojimbo chronicle. Usagi is a pretty reliable good story and the black-and-white art is always well-detailed and often humorous. Thumbs up to the Rabbit Ronin! Just... perfect.This is the Usagi storyline I'd give to anyone who wonders how a bunny samurai could be so captivating. Best Volume I've read thus far. The story arc in this one is actually quite touching, plus, Samurai Octopus! I love all the callbacks to earlier stories, plus more exploration of Usagi's sensei. Good stuff. Awesome. Sakai is a master storyteller. Napínavá romantická i strašidelná. To se mi na ní líbí. Contains several short stories that don't add much to Usagi's narrative. Also contains several interrelated stories that fill in some gaps. Stan Sakai - Stan Sakai (Japanese: 坂井 スタンSakai Sutan; born May 25, 1953) is an artist who became known as an Eisner Award-winning comic book originator.Born in Kyoto, Sakai grew up in Hawaii and studied fine arts at the University of Hawaii. He later attended the Art Center College of Design in Pasadena, California. He and his wife, Sharon, presently reside and work in Pasadena.He began his career by lettering comic books (notably Groo the Wanderer by Sergio Aragonés and Mark Evanier) and became famous with the production of Usagi Yojimbo, the epic saga of Miyamoto Usagi, a samurai rabbit living in late-sixteenth and early-seventeenth-century Japan. First published in 1984, the comic continues to this day, with Sakai as the lone author and nearly-sole artist (Tom Luth serves as the main colorist on the series, and Sergio Aragonés has made two small contributions to the series: the story "Broken Ritual" is based on an idea by Aragonés, and he served as a guest inker for the black and white version of the story "Return to Adachi Plain" that is featured in the Volume 11 trade paper-back edition of Usagi Yojimbo). He also made a futuristic spin-off series Space Usagi. His favorite movie is Satomi Hakkenden (1959).